“Bullet Code” and “Stage to Chino” (both ‘40) into comic form. “Bullet Code” in #78 was an excellent adaptation of the film with terrific artistic likenesses of George and Slim Whitaker as his saddle-pal Pop Norton. 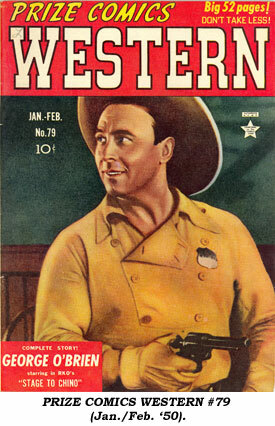 #79 featured George on the cover with the lead 10 page story a faithful adaptation to one of George’s best Westerns, “Stage to Chino”. For fans of Roy Barcroft, he’s featured here, pre his Republic days, as crooked stageline owner Dude Elliott. Leading lady Virginia Vale (left) is featured in both films. Superb art in both by Mart Bailey. Prize dropped their movie adaptations after that and went back to their fictional Western heroes, the Black Bull, Lazo Kid and American Eagle. 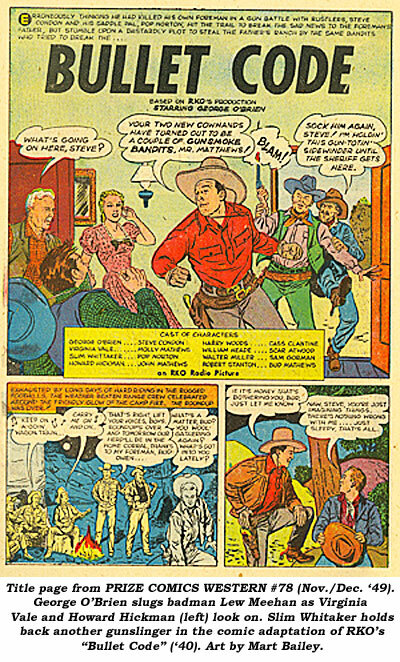 We also need to mention George O'Brien's "Arizona Legion" ('39 RKO) was adapted fumetti-style in MOVIE COMICS #2 (May '39), published by Picture Comics, a subsidiary of National Periodical Publications. Every issue of MOVIE COMICS told their stories with film stills. 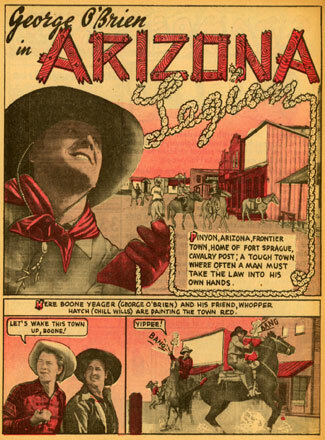 "Arizona Legion" adaptation ran for seven pages. All issues of MOVIE COMICS are quite rare. #2 in Fine is priced at $756 in OVERSTREET COMIC BOOK PRICE GUIDE.